I thought it would be interesting to show an example of an idea maze for an area that I’m interested in: AI startups. Here’s a sketch of the maze. I explain each step in detail below. “MVP with 80–90% accuracy.” The old saying in the machine learning community is that “machine learning is really good at partially solving just about any problem.” For most problems, it’s relatively easy to build a model that is accurate 80–90% of the time. After that, the returns on time, money, brainpower, data etc. rapidly diminish. As a rule of thumb, you’ll spend a few months getting to 80% and something between a few years and eternity getting the last 20%. (Incidentally, this is why when you see partial demos like Watson and self-driving cars, the demo itself doesn’t tell you much — what you need to see is how they handle the 10–20% of “edge cases” — the dog jumping out in front of the car in unusual lighting conditions, etc). “Create a fault tolerant UX.” Good examples of fault-tolerant UXs are iOS autocorrect and Google search’s “did you mean X?” feature. You could also argue Google search itself is a fault tolerant UX: showing 10 links instead of going straight to the top result lets the human override the machine when the machine gets the ranking wrong. Building a fault tolerant UX isn’t capitulation, but it does mean a very different set of product requirements. (In particular, latency is very important when you want the human and machine to work together—this generally affects your technical architecture). Ok so let’s suppose you decide to go for 100% accuracy. How do you get there? You won’t get the 10–20% through algorithms. You’ll only get there with lots more data for training your models. Data is the key to AI because 1) it’s the missing ingredient — we have great algorithms and virtually endless computational resources now, and 2) it’s the proprietary ingredient—algorithms are mostly a shared resource created by the research community. Public data sets, on the other hands, are generally not very good. The good data sets either don’t exist or are privately owned. “Narrow the domain.” The amount of data you need is relative to the breadth of the problem you are trying to solve. So before you start collecting data you might want to narrow your domain. Instead of trying to build a virtual bot that can do anything (which would basically mean passing the Turing Test—good luck with that), build a bot that can just help someone with scheduling meetings. Instead of building a cloud service that predicts anything, build one that can predict when a transaction is fraudulent. Etc. “Narrow domain even more.” After you are done narrowing the domain, try narrowing it even more! Even if your goal is to build X, sometimes building an MVP that is part of X is the best way to eventually get to X. My advice would be to keep narrowing your domain until you can’t narrow it anymore without making the product so narrow that no one wants to use it. You can always expand the scope later. “How do you get the data?” Broadly speaking, there are two ways: build it yourself or crowdsource it. A good analogy here is Google Maps vs Waze. Google employs thousands of people driving around to map out roads, buildings, and traffic. Waze figured out how to get millions of people to do that for them. To do what Google does, you need far more capital (hundreds of millions, if not billions of dollars) than is generally available to pre-launch startups. Startups are left with two choices to get the data. 1) Try to mine it from publicly available sources. 2) Try to crowdsource it. The most common example of 1) is crawling the web, or big websites like Wikipedia. You could argue this is what the original Google search did by using links as ranking signals. Many startups have tried mining Wikipedia, an approach that hasn’t led to much success, as far as I know. The most viable approach for startups is crowdsourcing the data. This boils down to designing a service that provides the right incentives for users to give data back to the system to make it better. Building a crowdsourced product is its own topic (which is why that part of the idea maze points to another, nested idea maze), but I’ll give an example of one approach to doing this, which was tried by company called Wit.ai that we invested in last year. Wit’s idea was to provide a service for developers for doing speech-to-text and natural language processing. The v1.0 system gave the right answer most but not all of the time. But it also provided a dashboard and API where developers could correct errors to improve their results. For developers using the free version of the service, the training they performed would get fed back to make the overall system smarter. Facebook acquired Wit so their future will unfold now as part of a larger company. The approach they took was very clever and could apply to many other AI domains. This is a rough sketch of how I see the AI startup idea maze. A few caveats: 1) I could very well be mistaken or have overlooked other paths through the maze — idea mazes are meant to aid discussion, not serve as gospel, and 2) As Balaji says, new technological developments can “move walls and change assumptions.” Look out especially for new infrastructure technologies (internet, smartphones, cloud computing, bitcoin, etc) that can unlock new pathways in many different idea mazes, even ones that at first seem unrelated. The idea is to initially attract users with a single-player tool and then, over time, get them to participate in a network. The tool helps get to initial critical mass. The network creates the long term value for users, and defensibility for the company. The “come for the tool, stay for the network” strategy isn’t the only way to build a network. Some networks never had single-player tools, including gigantic successes like Facebook and Twitter. But starting a network from scratch is very hard. Think of single-player tools as kindling. The holy grail of virtual reality, the one that’s always been out of reach until now, is presence. In the VR community, “presence” is a term of art. It’s the idea that once VR reaches a certain quality level your brain is actually tricked — at the lowest, most primal level — into believing that what you see in front of you is reality. Studies show that even if you rationally believe you’re not truly standing at the edge of a steep cliff, and even if you try with all your might to jump, your legs will buckle. Your low-level lizard brain won’t let you do it. Computer enthusiasts and science fiction writers have dreamed about VR for decades. But earlier attempts to develop it, especially in the 1990s, were disappointing. It turns out the technology wasn’t ready yet. What’s happening now — because of Moore’s Law, and also the rapid improvement of processors, screens, and accelerometers, driven by the smartphone boom — is that VR is finally ready to go mainstream. This has implications for the kinds of software that will succeed in VR. The risk is not that it’s boring, but that it’s too intense. For example, a popular video game like Call of Duty ported to VR would be frightening and disorienting for most people. These experiences will be dreamt up by “experience makers” — the VR version of filmmakers. The next few decades of VR will be similar to the first few decades of film. Filmmakers had no idea what worked and what didn’t: how to write, how to shoot, how to edit, etc. After decades of experiments they established the grammar of film. We’re about to enter a similar period of exploration with VR. Today we are announcing that A16Z is leading a $40M investment in Stack Exchange, along with earlier investors USV, Bezos Expeditions, Spark, and Index. 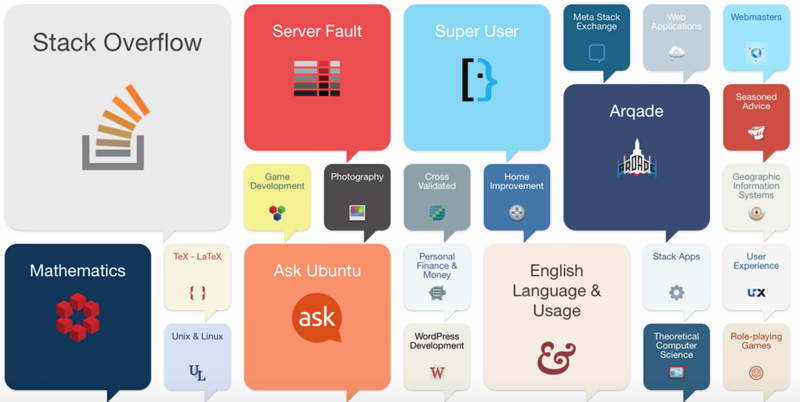 Stack Exchange is a network of 133 sites (and growing) where people can ask and answer questions about topics related to engineering, science, hobbies, and more. The biggest site on the network is Stack Overflow, which alone gets over 40 million unique visitors per month. The other sites cover a very wide variety of topics, including: math, gardening, English language usage, graphic design, physics, cryptography, chess, astronomy, Buddhism, data science, martial arts, home improvement, photography, bicycles, board games, economics, to name a few. Most likely, you’ve used Stack Exchange without even knowing it —the network had over 300M unique visitors last year. Many users come in through Google, get their answer, and then leave, usually a little bit smarter. One of the major startup opportunities of the information age is: now that more than two billion people have internet-connected devices, how do we create systems to efficiently share and store their collective knowledge? Requirements for successful collective knowledge systems include: 1) users need to be given the proper incentives to contribute, 2) the contributions of helpful users need to make the system smarter (not just bigger), and 3) users with malicious intent can’t be allowed to hurt the system. Many entrepreneurs and inventors have tried and failed to solve this problem. As far as I know, only two organizations have succeeded at scale: Stack Exchange and Wikipedia. Stack isn’t as large as Wikipedia on the readership side — the topics are more specialized—but, on the contributor side, is closely comparable to Wikipedia. Last year, Stack had over 300 million unique visitors, and 3.8 million total registered users, who contributed over 3.1M questions, 4.5M answers, 2.7M edits, and 17M comments. Stack’s business model is based on job placement. Employers create company pages (here is Amazon’s—over 6000 companies have created pages) and then run targeted ad campaigns for open job opportunities. Revenue has grown quickly, and the company employs over 200 people. The HQ is in NYC, with offices in Denver and London, and remote workers in Israel, Brazil, Japan, Germany, Slovenia, France, and across the US. I believe Stack Exchange’s growth has now reached escape velocity. Not only will the existing topics continue to grow, but many new topics will emerge, until the network covers every topic that is amenable to objective Q&A. As new generations of people grow up on the internet, old habits — searching through textbooks or how-to books, or asking friends—will fade away. People will come to expect that any objective question can be instantly answered with a Google search. I’ve been a personal investor in Stack since its initial funding, and it has always been one of my favorite investments. Stack’s cofounder & CEO, Joel Spolsky, is an amazing entrepreneur and internet visionary. I’m very happy to back him again with this new investment. I’m excited to announce today that Andreessen Horowitz is leading a $3M financing of Skydio, a startup developing artificial intelligence systems for drones. Drones are poised to have a transformative impact on how we see our world. They’ll enable us to film the best moments of our lives with professional quality cinematography and they’ll also change the way businesses think about monitoring their operations and infrastructure. This grand vision is starting to come into focus, but existing products are blind to the world around them. As a consequence, drones must fly high above the nearest structures or receive the constant attention of an expert operator. “Flyaways” and crashes abound. These problems must be solved for the industry to move forward. Smart drone operators will simply give high-level instructions like “map these fields” or “film me while I’m skiing” and the drone will carry out the mission. Safety and privacy regulations will be baked into the operating system and will always be the top priority. This is my second drone investment – the first one was Airware. I see Airware and Skydio as complementary (and I’d like to make more drone investments – at any stage including seed investments – as long as they don’t compete with Airware or Skydio). You can think of Airware as the operating system and Skydio as the most important app on top of the operating system. The founders of both companies have deep expertise in both aviation and computer science, the key prerequisites for creating smart drones.